The webcams or all-sky cameras page has been updated a little while ago. Broken URLs were removed and new ones are added. We also ranked the cameras according to where they are in the world. Click on the country you like and a drop down will collapse and show you the cameras. Do you know of a northern lights/aurora camera that isn't listed. Let us know! The magnetometers page was also updated with some little more background information about the magnetometers and the CANadian Magnetic Observatory System was added. TheCANadian Magnetic Observatory System also replaced the North American stack plot on the front page. Under the hood we added some tweaks to ensure that large graphs are displayed better on smaller resolutions. Happy new year everyone!Read our news post for a quick look back at 2018. We ended 2018 with making work of some refactoring and now the live graphs will load dynamically upon loading the site, no need to refresh the page anymore! Another New year's gift is something new in our app (available on Android and iOS). 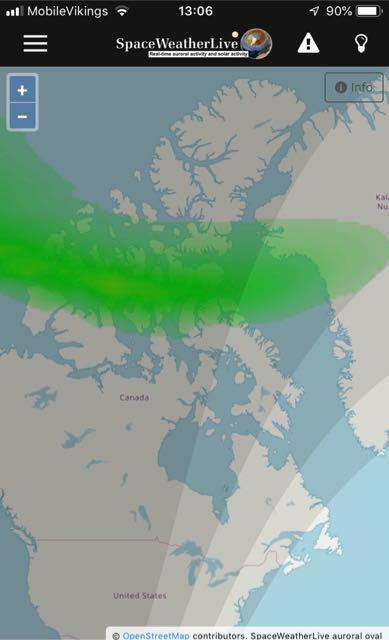 In the menu 'Auroral activity' when you click on 'Auroral oval' you'll get a big map to view the latest ovation model. It’s now easier than ever to view the ovation model on your mobile device. We have made some minor improvements to the STEREO page. STEREO is a mission consisting of two space craft in an orbit around the Sun. STEREO Ahead is in an orbit slightly faster than Earth's orbit and STEREO Behind is an orbit slightly slower than Earth's orbit around the Sun and this causes the space craft to slowly drift apart. STEREO Behind has unfortunately suffered a malfunction back in 2014 so there is currently no real time data coming from this space craft. We removed anything related to STEREO Behind from the STEREO page as its unnecessary to feature a set of blank images. Should NASA be able to recover STEREO Behind in the future we will of course bring back the data from STEREO Behind to the STEREO page. New on the page is a graph with Real Time Solar Wind data from STEREO Ahead. Just like DSCOVR, the STEREO mission has instruments on board (PLASTIC and IMPACT) to measure the composition of the solar wind and strength/direction of the interplanetary magnetic field at the space craft. Due to the location of STEREO Ahead, this data is of great use to see what kind of space weather conditions we could expect from any incoming coronal holes days in advance. We use this data a lot when we estimate the strength of any incoming coronal hole solar wind streams when writing the news. Minor tweaks but we hope you enjoy these changes. For Estionian users we also have good news. The Esteonian translator, @AhtoA, has been busy with translating the help section and the main jhelp page is now done with several help articles. Go check those out and a big cheers to @AhtoA for his work.